Black Magic Tan 700 machine with Deluxe Spray Gun offers reliable, simplified spray tanning at an amazing price. The Deluxe Gun has been our best performing spray gun for more than 6 years, with every part completely replaceable. At this price point it offers the best value on the market today. Our Deluxe Gun delivers a beautiful mist onto the skin and features a fully adjustable and stable, stainless steel nut that ensures reliable control over the flow of solution. Removable parts and a stainless spray needle allows easy cleaning and removal of tanning particle build up when required. A large majority of spray guns within the price range are fixed units which do not have replaceable parts. The HVLP700 is lightweight, with a convenient LCD push button to adjust the air flow depending on the thickness of the solution you are spraying. • Flex Hose with rotating swivel – prevents kinking. The Black Magic Tan pop up spray tan tent is made from the highest quality materials. Featuring a clear window on the top 1/3rd of the tent you will experience improved access to natural lighting while protecting your environment. With a purpose built opening at the back of the tent to accommodate our portable extraction unit, it can also be folded down when not in use to maximise your space. 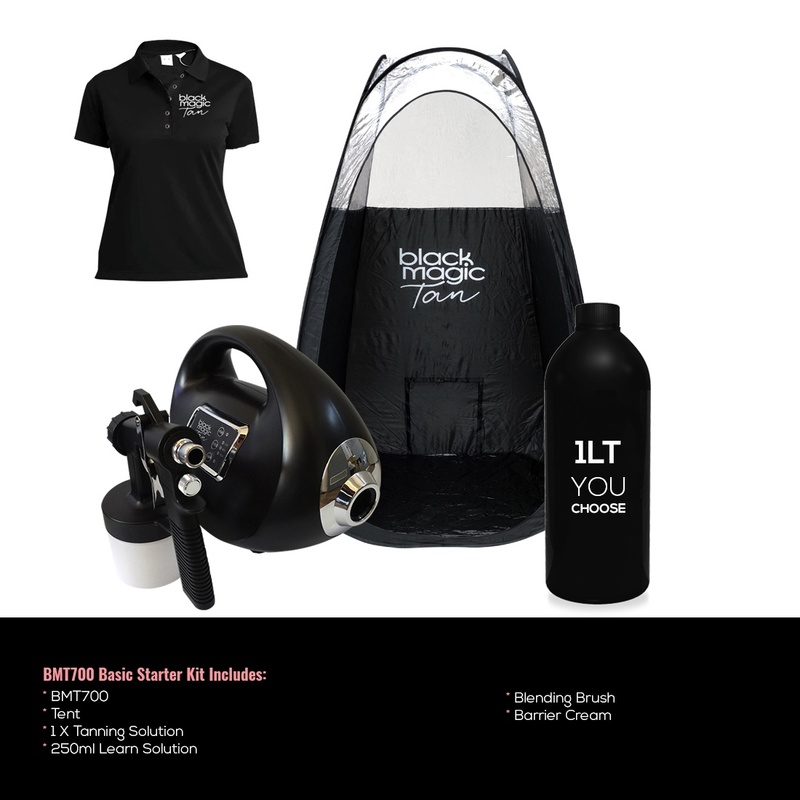 Black Magic Tan Learn solution was created to enable professional training of students or therapists wishing to refresh their technique. Learn delivers the same look, feel and finish of a spray tan without the DHA. Students can apply multiple coats on their model(s) without fear of leaving model(s) with a bad tan for days after training has been completed. Learn is Infused with Aloe Vera and Green Tea Extracts and won’t leave your skin feeling dry. Every aspect of the professional spray tan application is important, from prepping the skin for improved pH balance, choosing the right product to enhance the skin to locking in the tan and moisturising for longer lasting results – these small additions to a spray tan application make it a beauty experience that has clients coming back for more. Our FINISHING TOUCH BRUSH is no exception so it’s a MUST HAVE in your tool kit. Black Magic’s Barrier cream is a soft hydrating solution that is to be used in common areas that DHA or tan clings too leaving a nice even tan. Barrier cream is a very light weight, high grade, soft and refreshing moisturiser that is perfect for the professional tanning technician. It is perfect for competitors to help hydrate their dry skin and also make the removal of competition colour easier.